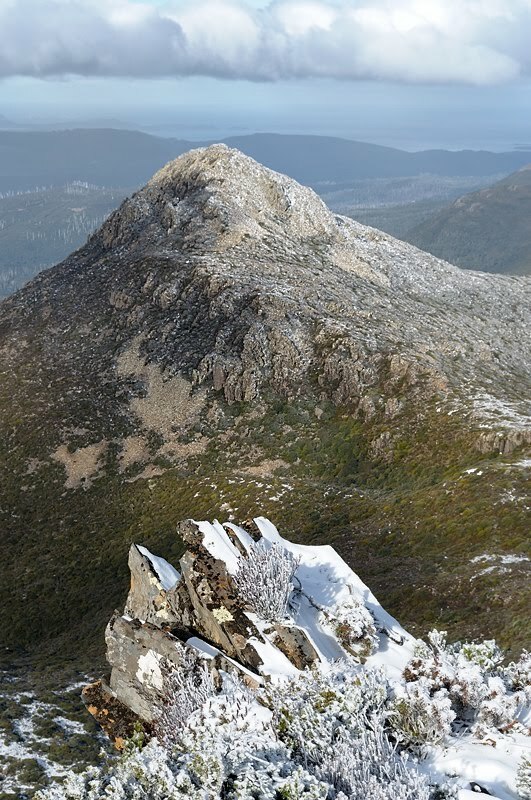 Had a couple of walks up Hartz Peak last weekend, actually hoping for good photographic light, sun on snow etc. It wasn't too bad, but while Huonville and elsewhere had pretty good weather, it was cold, windy and often cloudy at Hartz. Nevertheless, it was nice to wander about, and the snow and ice was quite attractive. There were some people out in the most horribly innappropriate clothing. They only went to Lake Esperance, and I think they found it rather uncomfortable. The bald man with no hat in the icy and occasionally wet wind was obviously uncomfortable. His daughter (well, I hope she was his daughter) was in fashionable, around-town gear. They were a bit uncommunicative when I passed them on the track. Here are a few photos from the weekend at Picasa. Beautiful photos, Mark. My favourite little mountain! Thanks for posting them; made my day. Thanks John, I like it too.